Albert the parrot was missing for two weeks, but a chance spotting in the UK town of Penzance set a few British Twitter users a-flutter. 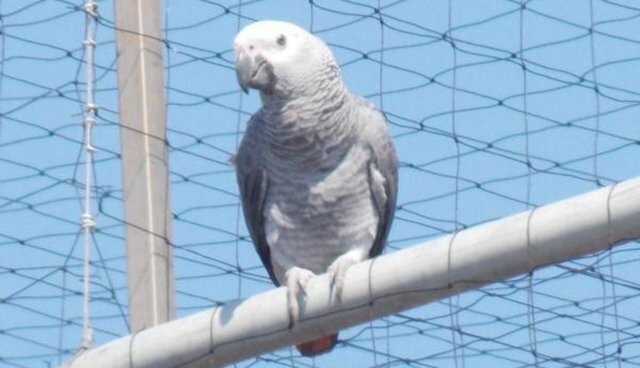 Albert the African Grey Parrot quickly became a star on the social media platform after Sandra Pascoe, who works in an office nearby, Tweeted: "Could you RT that a grey parrot is currently on the roof of Penwith Housing, Morrab Road, Penzance, please." Two Penzance security guards, Rob Gould and Melvin Gilbert, coaxed the African Grey parrot from off the roof with apple chunks, suffering a few beak-nips in the process. Albert is home once again with Dave, his owner. It's not the first time Twitter has stepped in to help a pet find his way home. In 2012, a Jack Russell terrier named Patch, who had stowed away on a Dublin-bound train, was spotted and then reunited with his owner.